These little pastries are so amazing! They’re light and fluffy and cinnamon-y and sweet! Almost light a donut, but without all the grease! I can see why these came be a household favorite! I loved biting into these rolls. The crunchy cinnamon-sugar topping set against the fluffiness of the roll is just amazing. We ate ours fresh out of the oven (after a short cooling time) and they were perfect! 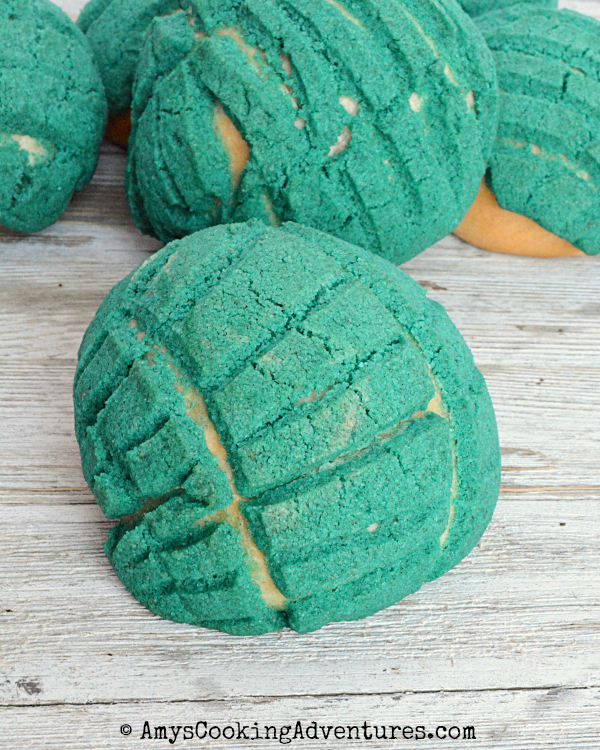 Happy #MexicanRecipes Let’s have a fiesta of Cinco de Mayo inspired recipes all week long! Place the water, yeast, and 1 teaspoon of the sugar in the bowl of a stand mixer. Allow the yeast to sit for 5 minutes or until foamy. Stir in the half & half, remaining sugar, butter, egg, and salt. Stir in 2 cups of the flour, stirring until smooth. Switch to the dough hook, stir in the cinnamon and 1 cup of the remaining flour. Add the last cup of flour a bit at a time until the dough is smooth and satiny. Knead for 3-5 minutes. Form into a ball. Place in a greased bowl. Cover and allow the dough to raise in a warm, draft-free area for 1 hour or until doubled in size. Punch down the dough. Cover and rest the dough for 10-15 minutes. Meanwhile, make the sugar topping. Place the butter and sugar in the bowl of a stand mixer. Beat until light and fluffy. Stir in the flour, cinnamon, and vanilla until blended. Stir in food coloring, if desired. Cover and set aside. Divide the dough into 12 pieces and form them into balls. Place the dough balls on a parchment lined baking sheet. Divide the sugar topping into 12 equal pieces. Roll into balls, them use a rolling pin to roll out the pieces so they are slightly larger than the dough balls. Wet each dough ball lightly with water and place the topping on top. Use a sharp knife to lightly score the topping. Cover and allow the rolls to rise until they double in size (30-45 minutes). Preheat the oven to 375 degrees F. Bake the rolls for 18-20 minutes or until the topping is crunchy and the sides are a light golden brown. Cool slightly. Serve warm or cool. Place the water, yeast, and 1 teaspoon of the sugar in the bowl of a stand mixer. Allow the yeast to sit for 5 minutes or until foamy. Stir in the half & half, remaining sugar, butter, egg, and salt. Stir in 2 cups of the flour, stirring until smooth.Switch to the dough hook, stir in the cinnamon and 1 cup of the remaining flour. Add the last cup of flour a bit at a time until the dough is smooth and satiny. Knead for 3-5 minutes. Form into a ball. Place in a greased bowl. Cover and allow the dough to raise in a warm, draft-free area for 1 hour or until doubled in size.Punch down the dough. Cover and rest the dough for 10-15 minutes.Meanwhile, make the sugar topping.Place the butter and sugar in the bowl of a stand mixer. Beat until light and fluffy. Stir in the flour, cinnamon, and vanilla until blended. Stir in food coloring, if desired. Cover and set aside.Divide the dough into 12 pieces and form them into balls. Place the dough balls on a parchment lined baking sheet. Divide the sugar topping into 12 equal pieces. Roll into balls, them use a rolling pin to roll out the pieces so they are slightly larger than the dough balls. Wet each dough ball lightly with water and place the topping on top. Use a sharp knife to lightly score the topping. Cover and allow the rolls to rise until they double in size (30-45 minutes).Preheat the oven to 375 degrees F. Bake the rolls for 18-20 minutes or until the topping is crunchy and the sides are a light golden brown. Cool slightly. Serve warm or cool. They are wonderful. I know what I'm serving up at my next Dive party. Thanks for sharing, Amy. Amy, I spent many years living in the Southwest and I grew to love these. There was a bakery not far from where I lived and my daughter and I would treat ourselves every once and a while. She loved Maranitas (pig shaped ginger bread) and I loved the Conchas. Thanks for the recipe and the memories. 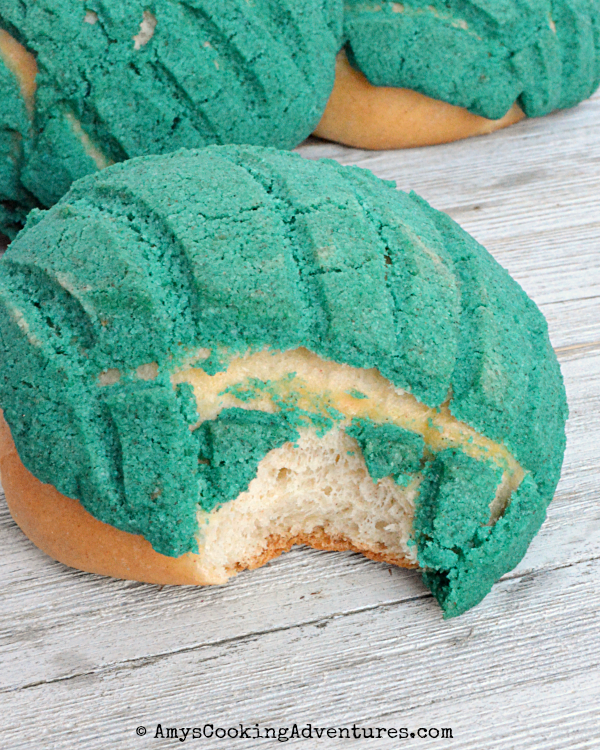 I've never heard of conchas sweet breads before, but I love the vibrant color in yours. They are so pretty! I love trying new baking projects, so these definitely need to go on my list! A coworker just brought some in from her mother, but wouldn't share the recipe! Now I can make it myself, and bring it to her! ha! thank you!